This innovative new map gives a different perspective to Birmingham, the Black Country and Solihull. It features 150 miles of traffic free walking and cycling paths along canals, rivers, and through the 8000 acres of parks of the Birmingham plateau. Fully coloured at 1:30,000 it is ideal for tourists and all leisure users, as well as boaters who wish to explore the region away from the canals and is supplemented by information panels and photographs. Walking: The detailed Birmingham City Plan at 1:15,000 is designed for exploring Birmingham city centre canals on foot and locating tourist attractions, art galleries, museums and shops. Gas Street Basin in Birmingham city centre is featured. This is now bustling with pleasure craft, restaurants and bars. Top entertainment venues such as the NEC, the International Convention Centre, the National Indoor Arena and the Birmingham Rep. are shown as well as the Bull Ring shopping Centre and New Street Station. View the Staffordshire Hoard in Birmingham Museum and Art Gallery. Other attractions include the Black Country Living Museum, the Dudley and Netherton Tunnels, Farmer’s Bridge Locks, Sandwell Valley Country Park, Bruton Park in Solihull, and Walsall Art Gallery with its world class collection of Jacob Epstein sculptures. 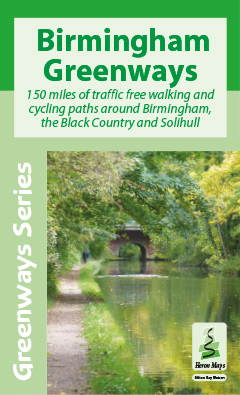 The Birmingham Greenways map is available to buy online or by telephone from our business partner, Guidepost. Click on the logo below to visit their store.